Wellness travel might have once been a niche trend but the ever-growing popularity of hotel programmes, retreats and specialists make it clear: The category is here to stay. Many destinations offer guests an opportunity to learn from top-of-their-field gurus – visiting chefs, athletes, healers, teachers, doctors and even Buddhist monks – who fly in to guide travellers toward spiritual healing, healthier habits and elevated skills. Sessions run the gamut from sleep training with world-famous CEOS to food prep with Michelin-star chefs. High-end spa and wellness resorts offer sugar-free detox diets, where the purge delivers on a promise of clearer skin, a more efficient digestive system, and increased energy. Sugar-free diets are high in fat and protein, designed to leave guests sated despite the restrictions. To complement the nutrition component, programmes include a bevy of activities like yoga, meditation, acupuncture, energy healing and massage, making it easy (enough) to forget that you cannot have a slice of cake for dessert. 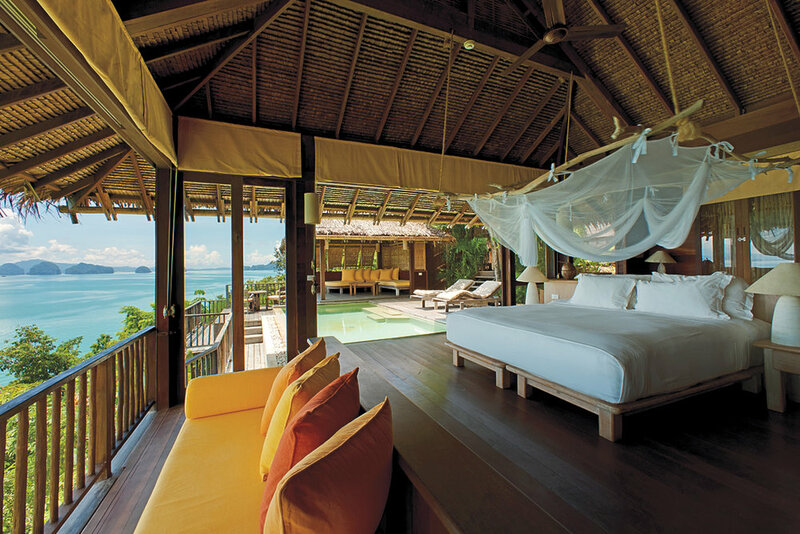 Six Senses Yao Noi, Thailand. With age comes maturity, wisdom, financial security … and all too frequently, a reminder of mortality as loved ones begin passing away. Enter the grief getaway: a journey to find solace and healing. “I find my clients asking for a spa holiday when they have just experienced the loss of a family member or a tragic event in their life”, says Lynne Adams, a Virtuoso advisor. “They need that week away to regenerate because day-to-day life can be so stressful.” Not all are mourning literal loss, but maybe a life change, such as a divorce or an empty nest when the last kid goes off to college. Gone are the days of spas garnering praise for mere stress-relief and relaxation benefits. Now, a hard-science medical component is en vogue. At these centres – equal parts relaxing and regenerative – highly-trained specialists run a battery of tests to determine not just what ails you, but also how elusive issues might be specifically treated. After identifying the best course of action, facilities offer a personalised programme – frequently including customised diets based on DNA and blood type. Sleep deprivation has been linked to a myriad of medical issues, ranging from heightened stress to weight gain to depression and a weakened immune system. As a result, certain facilities offer programmes specifically designed to improve the quality of zzz’s. The goal: By bettering the quality and duration of your sleep, you will improve your entire life. Programmes might focus on internal coping mechanisms through stress management, or external improvements through fitness programmes such as yoga. Most will frequently include massage and meditation, too. In this era of constant communication, shutting out (and off) the cacophony of incessant chatter might be the biggest luxury of all. Where digital detoxes have long been a popular trend, 2018 goes one step further: Silence is golden. At these properties, merely logging off Twitter or not Instagramming a meal is not enough. Here, you can find blissful peace while checking into guestrooms with Wi-Fi blockers, enjoying blindfolded floating massages to mute multiple senses, and taking part in quiet mindfulness sessions and meditative forest walks. Get in touch to book your next wellness holiday!